Italians love to egg, bread, and fry foods. From vegetables like cauliflower and zucchini to meats like chicken and veal, there aren't too many foods that don't taste better when egged, breadcrumbed, and fried. When I was a kid, veal scallopine Milanese, veal cutlets coated in egg and breadcrumbs and fried until crisp, was always a beloved feature of our Sunday dinners. No one could resist that crunchy, glistening exterior and tender, moist interior, which paired perfectly with garlicky broccoli rabe. Of course, the best part about making veal scallopine Milanese on Sundays was the sandwich you'd take to school on Monday. My mom wasn't a believer in dainty sandwiches. She never even bought sliced white bread. Instead, Mom would spilt a chunky Italian roll down the middle and wedge a veal cutlet inside. Then she'd smother it with leftover garlicky broccoli rabe, some Provolone or mozzarella cheese, and maybe one of my dad's hot cherry peppers, if we were lucky. Lately Jeff and I have been on a veal cutlet kick, thanks to Mom who bought us three pounds last time she was here. "Mom, three pounds for two of us?" I said. "If you can't eat them all now, just freeze them, honey. They won't go to waste," she replied. Each time I make veal scallopine Milanese for Jeff and me, I promise myself that I'm going to top them with Marsala spiked mushrooms or sauteed baby artichokes and asparagus. Then I do what I always do: make sandwiches. You should do the same. This isn't just any sandwich, it's a dense, crunchy, salty, smoky, garlicky sandwich that is wholeheartedly satisfying. So go ahead, mangia! By the way, Mom was right. That sandwich you're looking at was made from the third and final pound of veal cutlets. 1.Place the veal cutlets between two sheets of plastic wrap and pound them gently with the toothed side of a meat mallet to soften the meat. Then use the smooth side of the mallet to flatten the scaloppine to about a 1/4- to 1/8-inch thickness. 2. Spread the flour on a sheet of wax paper or a large plate. In a medium bowl, lightly beat egg. In a separate bowl, mix breadcrumbs, cheese, red pepper flakes and salt. 3. In a medium skillet, heat butter and olive oil over medium heat until mixture starts to bubble and foam. 4. Meanwhile, dredge the veal in the flour, shaking off the excess. Then dip it in the egg, letting any excess drip into the bowl. Finally, gently place it in the bread-crumb mixture and turn to coat evenly. Repeat with remaining pieces of veal. Place in the skillet, without overcrowding. Fry for about 3 to 4 minutes, or until the underside looks crispy and golden brown. Turn once. Add cheese, and cook about 2 minutes more, until cheese is melted. Turn off heat. 5. To make the garlicky greens, heat heat oil in a medium skillet over medium high heat. Add garlic and lightly brown, 1-2 minutes. Add greens, tossing frequently, until cooked down and tender, about 5-6 minutes. Remove from heat. 6. Add prosciutto to a hot skillet just until crisp, 30-60 seconds. 7. 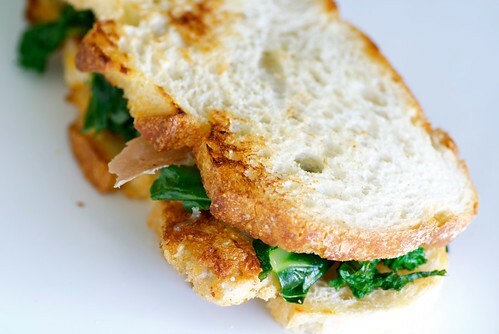 To assemble sandwich, place half the veal on one slice of toasted bread. Top with half the garlicky greens and prosciutto. Repeat with second sandwich. Serve immediately. Italians and Southerners share that love of all things fried, huh? ;) Looks great. I order veal often, and a sandwich with greens sounds amazing. Hope you're well! I adore veal and wish it weren't so expensive! I think this sandwich would be worth the indulgence though. It sounds fabulous! That is a lovely-looking sandwich! Adding greens sounds great too and so does the hot cherry pepper. There was a take out restaurant close to work that would have something similar as a special once a week. Well worth the visit!! Gorgeous sandwich. Why didn't I get an Italian mother to make one for me? I guess I was in the wrong line. Sigh. But at least you are generous enough to share the recipe with me. Then maybe my kids will feel like they were in the right line. Funny my school lunches were pretty similar! I'm having meatloaf sandwiches tonight. Instead of mayo I'll try mozzarella and garlic-y kale or swiss chard. My backyard garden is overflowing with both so I'm on the look out for new ways to use 'em up. Theres no such thing as Scallopine Milanese. I live there and its called COSTOLETTO MILANESE but I think you mean Cotoletta. abby-I hadn't thought about it, but you're right! joanne-It is an indulgence, but well worth it. lisa-Oh, those hot cherry peppers were awesome! val-I'd be frequenting that place! sues-At least you're eating it now! elly-I would like it too! mary-I'm so happy to hear that. I hope it was good! chris-You're sweet. Who doesn't love a good Italian sangwich, am I right? ramblingtart-Yay! I love when I inspire people to eat sandwiches. It's one of life's greatest joys! bayonet-Thank you for telling me that. "Veal scallopine Milanese" is used in the States, even if it is technically incorrect. What a great idea to put the garlic greens on the veal! This has got to be the perfect sandwich. anonymous-So glad you like it! Would like to include your veal recipes on vealrecipes.com including a recipe source link back here. I'm making veal cutlets for dinner tonight and looking for something new. Beautiful sandwich, lovely post! anonymous-Thank you. I'll be in touch.